At StarFit Studio in Arlington, we’re committed to providing a fun, safe, and judgement-free workout environment. We do this by capping small group fitness classes at eight members, offering in-house nutritionists, and making every member feel like part of the family. See the difference a supportive gym can make. Join StarFit Studio today in Arlington. StarFit Studio in Arlington is so much more than a gym — it’s a community dedicated to women’s fitness. If the traditional gym atmosphere doesn’t work for you, it’s time to make a change. Learn more about what sets our local gym apart, and join us today in Arlington! When you join StarFit Studio, gone are the days of overloaded fitness classes, wandering aimlessly around the fitness floor, or feeling unsafe and judged as you workout. There’s nothing more helpful when you’re starting a fitness routine than joining a community that actually supports you. And, there’s nothing more helpful to meeting your fitness goals than having a fitness family to hold you accountable. At StarFit Studio in Arlington, you get this supportive fitness community — and then some. A group fitness class jammed with 50 people can only be so good. The one instructor must teach to the middle skillset of the class, leaving some bored and unchallenged and others exasperated and demoralized. At StarFit Studio in Arlington, we cap our small group fitness classes at eight people. We’ve found that this is the perfect number — you have built-in energy and motivation from having other people around, but you still get the individualized attention you want from the trainer. Our women’s gym in Arlington also makes smart use of fitness technology. During each class, a visual timer keeps participants moving through different stations at a dynamic tempo. Rather than getting bored by doing the same exercise over and over, you’ll stay engaged by constantly changing up your workout. Plus, all group fitness classes are taught by certified personal trainers. In addition to our eight-person group fitness classes, our fitness studio in Arlington also features yoga and dynamic mobility classes for recovery, deep tissue release, and improved mobility. Improve your general well-being with this focus on holistic fitness. Each class is taught by a certified personal trainer, so you benefit from professional expertise during every fitness class. Take advantage of the services from our in-house Holistic Health Coach and Integrative Nutrition Health Coach. Living a healthy lifestyle is about much more than burning calories — that’s the part our group fitness takes care of. It’s also about nourishing your body. StarFit Studio and our nutrition services encourage this holistic approach to health. 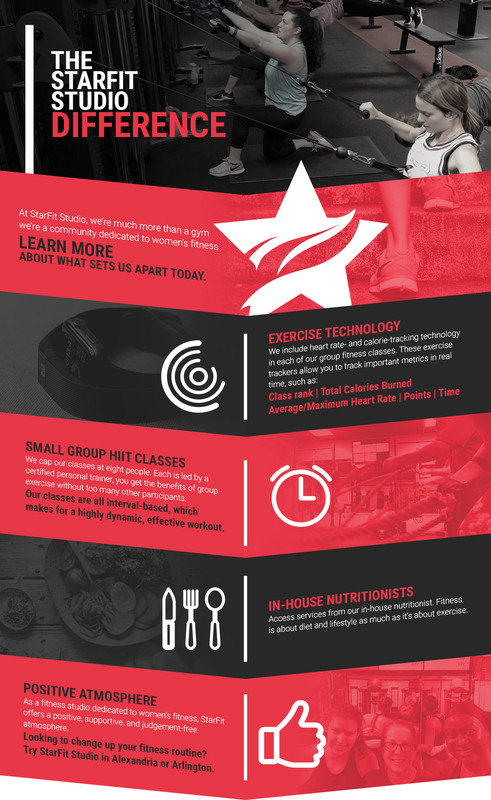 There are so many answers to the question “Why StarFit?” — and one visit to our fitness studio in Arlington should answer them all. Stop by today for a free trial to see what our women’s fitness community is all about. Join us today for a free session in Arlington.